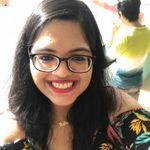 Pre-Wedding Video Punjabi Style: 5 Cues How You Can Add the Desi Swag to Your Wedding | Wedding Tips ARE YOU A VENDOR? 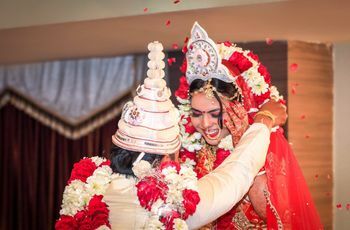 While Indian weddings can be extremely chaotic with numerous rituals, shooting for a pre-wedding video Punjabi style can give the couple a chance to be intimate and just be themselves. Pre-wedding shoots also give the couple some intimate moments, away from the chaos. They not just make amazing videos, but also make amazing memories. 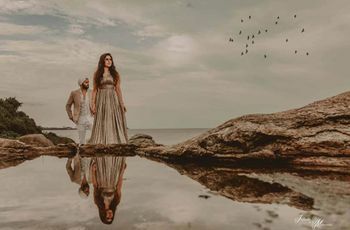 Shooting pre-wedding videos in the ‘land of five rivers’ is a unique way for a bride and groom, to showcase their love for each other, their individual personalities and their common interests. 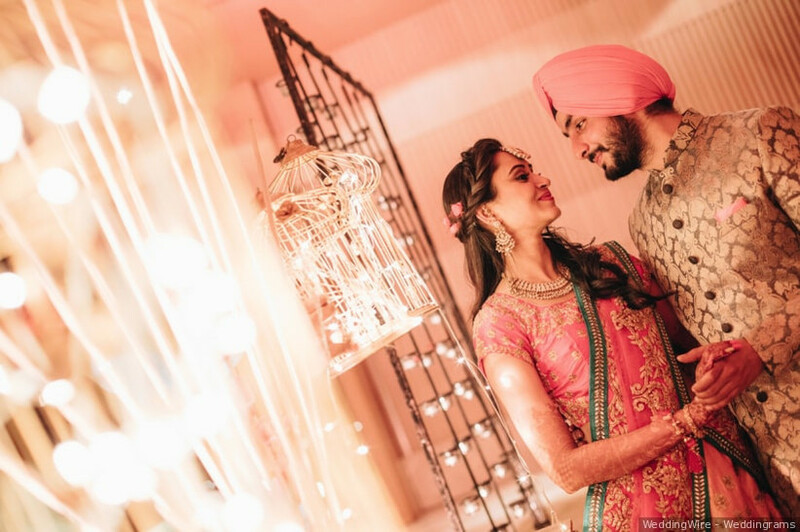 A pre-wedding video Punjabi style helps create an understanding between the photographer and the couple before they start capturing their big day. To make a decent pre-wedding video Punjabi style, the couple can share their ideas with the photographer. This way, photographers can help the bride and groom share their story in a timeless way, something that will make the video relevant even after 20 years. 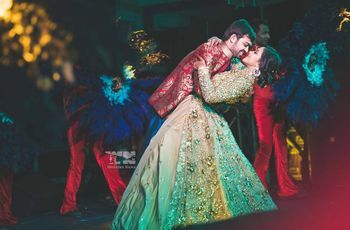 Punjabi wedding is a loud musical extravaganza, and if you’re a Punjabi groom, you must wear traditional Punjabi Gabru attire for your pre-wedding video. Nothing works better than a traditional kurta, a vibrant Pagdi and traditional Jutti. You can pose in front of a tractor, use a Latth or a steel tiffin in your pre-wedding videos to add the vibrant fervour of Punjab. Shoot a video that captures the traditions of a Punjabi wedding. 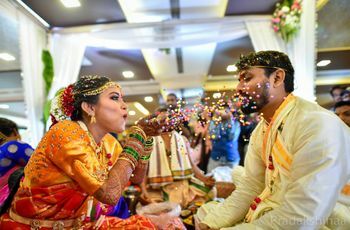 A Gabru groom is incomplete without a proper Patola bride. A Punjabi bride who dons a traditional Punjabi patiala suit, Mojaris, and a Parandi tied to her hair is the perfect ingredient of a Punjabi pre-wedding video. If you’re looking for bridal makeup hacks & inspirations then you can refer to our blogs as well. Use some trending Punjabi songs to add that jazz. Managing a pre-wedding shoot with a traditional khet backdrop should be a must-do. Sarson ke khet with blossomed yellow flowers is a super idea to capture the true Punjabi essence. Include a tractor, or a train in the background, to make the whole scene look more authentic. The "Jaa Simran jaa, jee le apni zindagi" has given all of us a vague idea of how the trains are important for a love story in Punjab and the fields of yellow and green are the apt place where you can show off a gorgeous dupatta scene in the wind and your Mr Right will be all handsome in a tractor or the essence of the soil of Punjab - the fields where the hard work goes in. No pre-wedding video Punjabi style is complete if they do not depict snippets of your love story. Before you choose a videographer, discuss with your partner what all you wish to include in your video. If you’re comfortable then you can include subtle hints of your love story, here and there, in your pre-wedding video too. Whether you met a coffee shop, or are childhood sweethearts, it may not be possible to include everything but you can definitely capture the essence of your love story. Use some songs that say 'I do' to add a dash of romance to our epic tale of love. The pre-wedding videos are also a safe bet to be included in e-invites that are sent to the family members, and including your story is all the more exciting. No Indian wedding is complete without some peppy Punjabi music. The Dhol, Dhamaka and Masti are all elements of a fun Punjabi wedding. To not include a peppy Punjabi number in your pre-wedding video, will be no less than a crime! ;) You can also discuss the kind of music you wish to include in your pre-wedding video. If you have a love song, you must include that to make your pre-wedding video more personal and so that when you revisit the tapes, you can relive the gorgeous freshness of first found love in each other. Try to shoot early morning or in the evening. The afternoon has very harsh sunlight. The perfect timing would be to shoot between 5.30 am to 10 am or 5 pm to 6 pm. These timings are the best when the sunlight is mild and yet right for the frames. The pre-wedding shoot depends on the couple, and how comfortable they are with each other. If you aren’t comfortable with mushy shots that ask you two to be too close, then please do let the videographer know in advance. You must be honest with the kind of shots you wish to include so that the pre-wedding video comes out just the way you always wished for. While you should be yourself, it’s always nice to opt for traditional outfits and flowy dresses that can catch the wind. Discuss with the videographer what kind of colours will look good during the daytime and during the evenings. Sometimes you need to also take care about what kind of background you’re shooting at. For example, avoid wearing green while shooting at a park. Discuss with your photographer on the kind of shoot you want. If you want to add a fun element in your pre-wedding shoot, then you can use fun and quirky props. Using props like Latth, tiffin, Charpai, Jutti, balloons, and vintage cars can add a lot of drama to your pre-wedding videos. When it comes to choosing songs for your video, choose love songs or peppy numbers whose lyrics go best with you as a couple. Avoid using breakup songs just because they sound nice. Sometimes you and your partner may have a favourite song, or have a song that played on your first date, or on your first drive, you must include that in your pre-wedding video to personalise it. Be comfortable with the videographer and he will have a crew to hold the right reflectors and lights fro the balanced effect on the natural light and you need to be comfortable to let them and their crew be around you and catch you off-guard because candids are never out of trend for a perfect pre-wedding video in Punjabi. Find your perfect wedding videographer for your pre-wedding video Punjabi-style and share your thoughts with us through comments.